What Fabrics Are Lampshades Typically Made Of? Silk is the most traditional fabric choice for lampshades, but other fabrics, including linen and leather, also are popular choices. Each type of fabric gives the lampshade a different aesthetic. Lampshades are made of natural and synthetic fabrics. Silk is formal, linen more casual and leather has a masculine feel when made into lampshades. 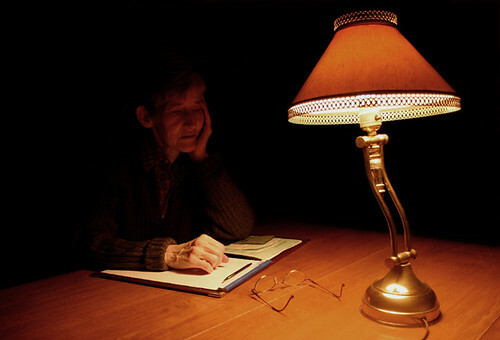 Silk and linen are the most common lampshade fabrics, but leather has gained appeal, especially on modern-styled lamps. There are synthetic fabrics available that mimic the look of popular natural fabrics. Synthetic fabrics will last longer and are less prone to fading and disintegration than natural fabrics. Although white and cream are the most popular colors of lampshades, you also can choose a fabric to coordinate with the color scheme of your room. Always check to see what your lampshade fabric looks like when light is shining through it to make sure it coordinates with your decor. For example, a deep, rich red can become an undesirable orange when the lamp is turned on. Lampshades are not always made out of fabric. Metal lampshades, a very modern choice, and paper lampshades, an inexpensive choice, also are available to purchase. Amy Swanton Mills is a writer and designer residing in Los Angeles. She has spent the past 10 years working in various aspects of the architecture, furniture and interior design industry. Her articles on furniture, design and green lifestyle issues regularly appear on eHow.com and furnicology.com. She earned a Bachelor of Arts degree in English and History from UCLA.